Superior finned tubular steel element design. Manual and automatic reset thermal cutout provides protection against overheating. Ideal for hallways, entryways, solariums, staircase landings, bedrooms, kitchens and living rooms. 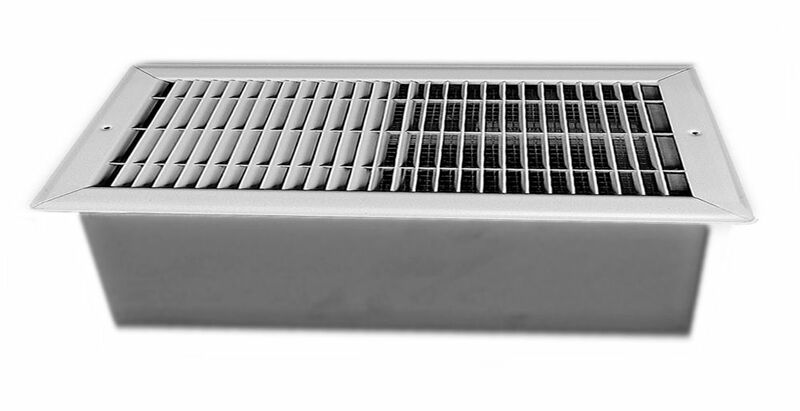 This Hampton Bay Floor Register fits a 3-inch x 10-inch duct opening. Its chic, geometric design effortlessly gives your home a modern, elegant look. This register is easy to install--just drop it in place--and its easy air flow control feature and rust-proofed easy-adjust damper make fine-tuning your home's environment simple. Wateralarm is recommended to guard against leaks and over flow from water heaters, dishwashers, washing machines, sinks, lavatories, refrigerators, water filters, toilets, water softeners and sump pumps. The 110db alarm can be heard throughout the house, detecting leaks before it causes costly damage. No installation required; just place on the floor near water sources and it will detect as little as 1/32" of water. For functionality purposes the sensor wire can extend 6' for hard to reach areas. Floor Drop-in Heater Designed for fan-forced comfort where floor mounting is desired.